KLAW LNG is the global leader in the design, manufacture and application of liquid natural gas (LNG) transfer systems. KLAW LNG designs and manufactures both the individual components and the complete transfer systems for the transfer of LNG, which is typically to temperatures of -162°C (-260°F). These safety transfer systems minimise the risk of LNG spill by shutting down flow when an emergency event occurs. The system will also separate when required. KLAW LNG systems are therefore designed to deliver both ESD-1 and ESD-2 operations. These systems protect assets, personnel, the environment and the reputation of the LNG industry and are in use by major LNG transfer owners and operators around the world. Hundreds of LNG commercial transfers are now conducted every year using KLAW LNG transfer technology which is proven to deliver reliable and safe LNG transfers. 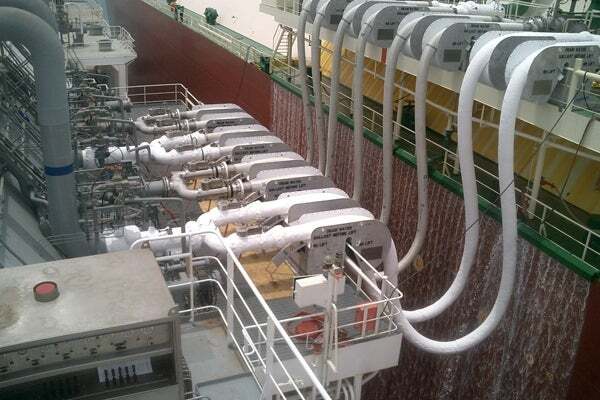 KLAW LNG systems include emergency release couplings, system control units (including SIL2 Compliant PLC Systems), vessel separation detection systems, ESD integration, hose saddle and fall arrest systems. KLAW LNG engineers work closely with owners and operators to deliver efficient and reliable solutions that meet the particular requirements of their LNG transfer systems. KLAW LNG is launching a White Paper examining the variables in managing a SIL2 complaint LNG safety critical flexible hose transfer system. The Coral natural gas field located in Area 4, offshore Mozambique, is being developed by Eni as the operator. KLAW LNG will provide a unique insight into delivering SIL2-compliant LNG hose transfer operations at Gastech 2018 (stand O129, Fira Barcelona, Gran Via, 17-20 September) and it’s an experience not to be missed. Liquefied natural gas (LNG) transfer and bunkering solutions specialist KLAW LNG is pleased to announce the successful upgrade of its fabrication and testing facilities at the company’s Great Yarmouth Technology Centre.